Spinach and Wine: Pear Cake..Its not pretty but it sure is good! 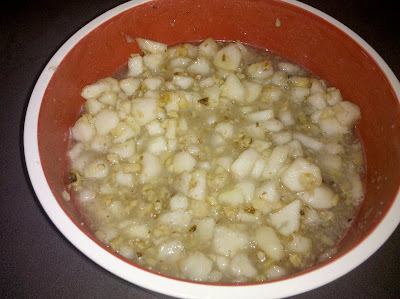 In a bowl, mix pears with sugar and nuts; set aside and let stand for 1 hour, stirring frequently. Add dry ingredients to the pears; stir to combine. Add oil, vanilla, and beaten eggs. Stir to blend. 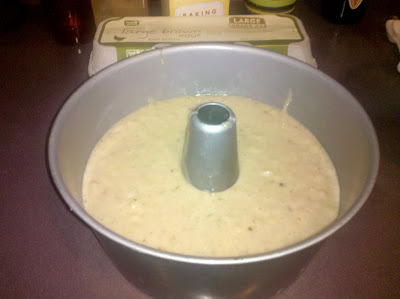 Pour batter into a generously greased and floured tube pan. Bake at 350° for 1 hour to 1 hour and 15 minutes,or until a wooden pick or cake tester inserted in center comes out clean. This pear cake can be baked in a 9x13-inch rectangular pan for about 45 to 55 minutes.